While our days of attempting Partridge Family-style sing-alongs are long gone, Haim has us suddenly wishing we kept up the act. The three SoCal sisters first landed on our radars earlier this year, and you can bet we were pleased as punch to chat with them at SXSW. Just based on their beats alone, we knew these L.A. ladies loved themselves some '90s style, but nothing proved the point quite like their latest feature in ASOS magazine (that, and their love for Destiny's Child and TLC). 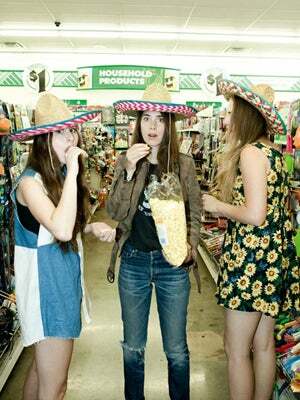 Clad in sundresses that Blossom would go gaga for, and tops reminiscent of grungy garage bands, the trio traipses around their very own backyard and the local dollar store with sombreros and popcorn in tow. Man, we wish our siblings were this fun! Take a look at the entire spread over at ASOS, and don't miss their candid interview with the mag. Those Haim girls don't hold back, especially when the topics of Spice Girls, thrifting, and J.Lo are on the table.